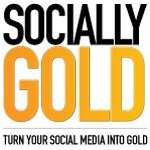 Adam from SociallyGold really has a gift for impeccable timing. Just this week he tweeted a solution to a problem I was having just as it was at the forefront of my mind. You see, I am helping a friend who is a public speaker consolidate Facebook fan pages that were created for him by his fans. My friend actually has a fear of Facebook, but that’s a blog for another time. So we were talking about what we could do to try a forced migration or close one page, knowing we would lose a majority of followers simply out of apathy. It’s like he’s in my head! So I click on the link, clickable version here, and it solved our problem! Some may say this is a bunch of hogwash, just a neat coincidence. I reject that claim and insist it is Socially Gold.